Last month, one of the six live/work units sold for $589,000. It appears there won’t be any work happening in the live/work unit since the ground floor commercial space was marketed as and is being used as a second bedroom. Unsurprisingly, the city permitted these live/work commercial units as a back-door way to put out-of-human-scale, multi-family townhomes on a small corner of Ballard not zoned for them. Neighborhood construction projects–like all construction projects–are expected to follow public safety rules. For example, workers are expected to park away from crosswalks so there’s visibility for pedestrians, cyclists and drivers to safely use the right of way. Legally, vehicles should park 20 feet from a crosswalk–even an unmarked one. Last week, a worker’s van was parked too close to the crosswalk at NW 70th Street and Division Ave NW, making it impossible to see oncoming traffic. This happens all the time, and the workers say it will slow them down if they have to park down the block (which they need to do because their other vehicles are taking up the parking by the construction site). That intersection can be a hairball, and moving the van would alleviate the safety issue. Lots of elementary school kids use that crosswalk to walk to school and their bus stop. 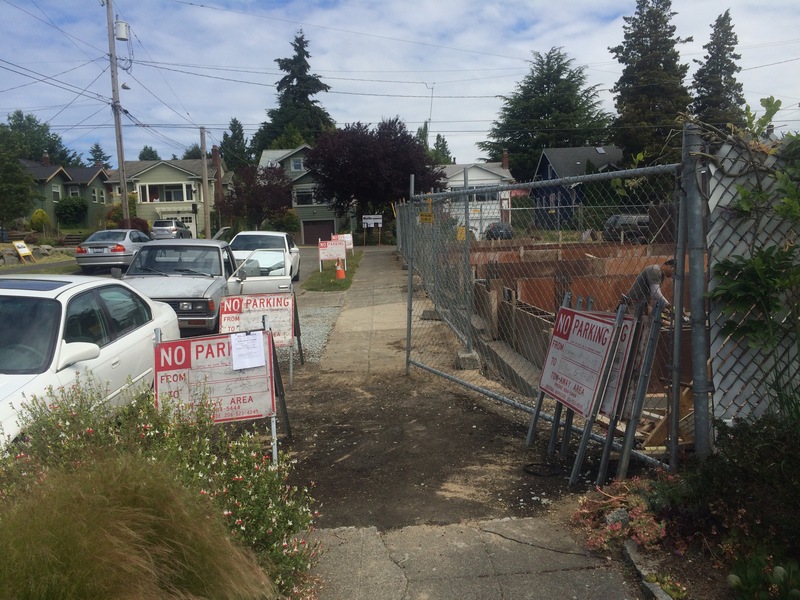 So a mom asked David Marcoe–owner of 819 NW 70th Street / 6752 Division Ave NW, developer with Blueprint Capital, and a real estate agent with Seattle’s Windemere Northgate office–to ask his workers to park so there’s visibility for the kids to safely cross the street. Seems reasonable for a developer, who also sells homes to families in this neighborhood, to care about his project putting kids in harm’s way. This is the response to a request to park work vans so elementary school kids can safely cross the street? 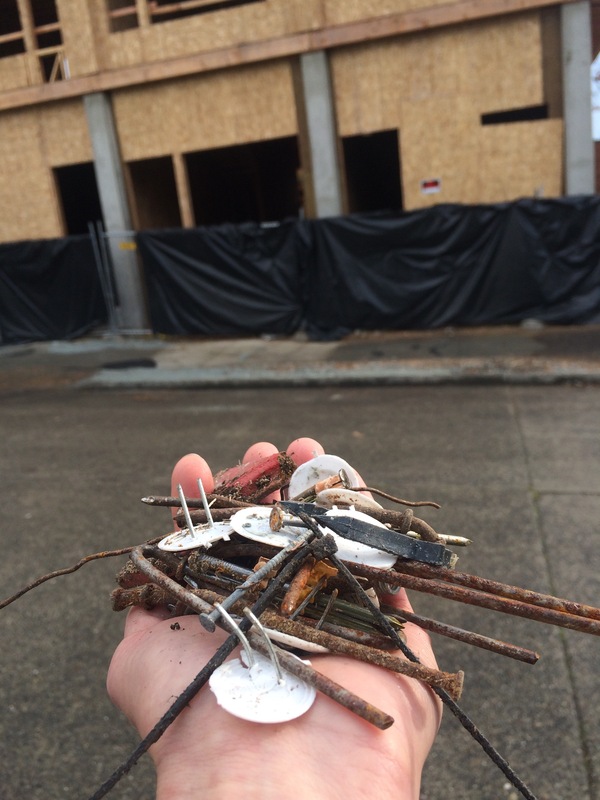 Below is one day’s collection of nails, staples and other debris left on the street, public sidewalk and parking strip by the construction site at 819 NW 70th Street. 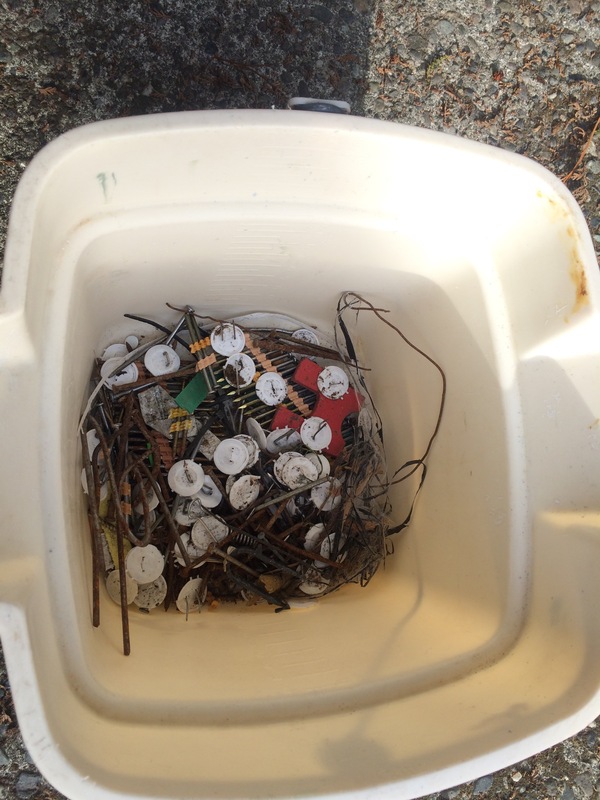 Lots of nails, staples and other stuff is left daily on the sidewalk where young kids walk and play. People of all ages ride bikes and walk here. This pokey stuff is unsightly and unsafe. 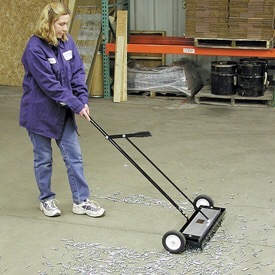 No one wants a nail in a bike or car tire or staple in their foot. Illegal No Parking Signs. Again. The city continues to look the other way while the developer puts up invalid no parking signs on NW 70th Street. Again. He’s taking away much-needed parking from the neighboring retail store’s customers and delivery trucks as well as residents. Why have land use code if the city doesn’t enforce it? Seattle’s land use code requires 84 square feet outside for garbage and recycling containers for each of the two live/work “triplexes” at 819 NW 70th St. However, the developer, Blueprint, is allotting only 30 square feet outside for each triplex. According to Blueprint’s response to the DPD about building plans not meeting the 84 square-foot requirement, Seattle Public Utilities wrote a letter for 819 approving the plan to locate 54 square feet inside closets in each triplex. No one is going to put a week’s worth of stinky trash and compost inside their units. Pet poop? Rotting food? Dirty diapers? Ick. The reality is there will be 18 containers outside in a space that can’t accommodate the 168 square feet legally required for them. 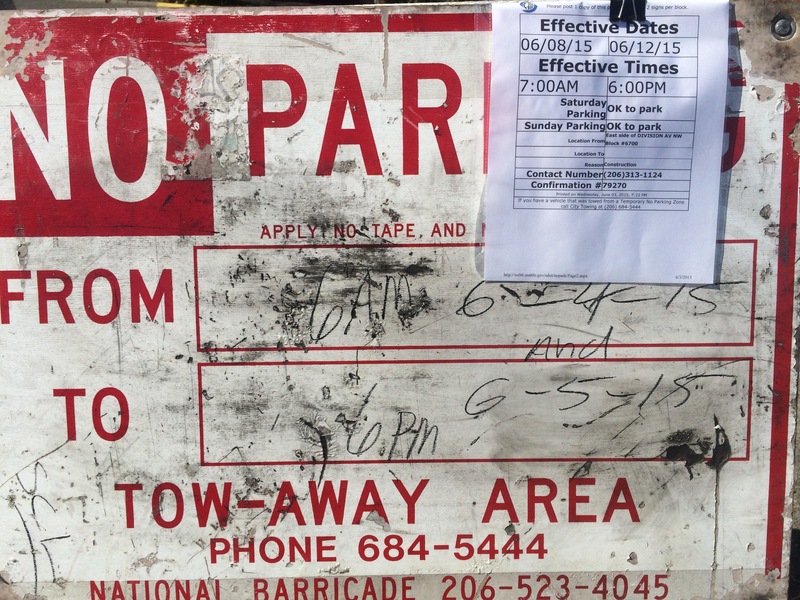 Does SPU have the authority to override code? Why have code if the DPD isn’t going to enforce it? If the DPD isn’t going to do its job, why have the DPD? 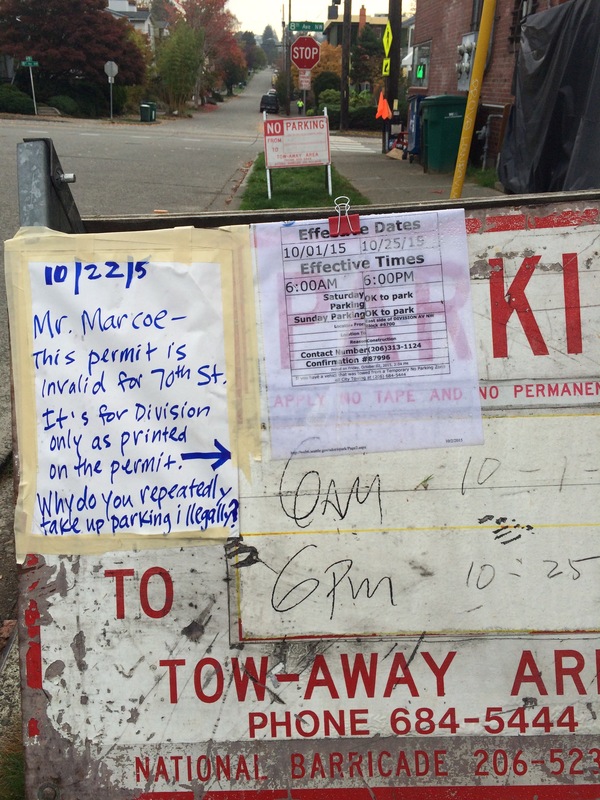 David Marcoe, owner/developer, put up 10 no parking signs on 6/3 along both sides of 70th Street and the east side of Division preventing residents from parking near their homes and Take 5 Market customers from parking near the store. He had no permit to do so. When confronted 6/4, he said he had a permit and then attached it to the signs and left the signs in the parking strips. However, the permit starts 6/8 and only for the east side of Division, not 70th Street. The shenanigans and disrespect for the neighborhood continue. It’s fine to develop the property but it’s wrong he’s doing it in such an inappropriate and disrespectful way with the city’s approval.